I was still uncomfortable checking mite levels, though as my mentor was out of town for the weekend I was on my own. There are two common ways to check mites: an alcohol wash and a sugar shake. Both methods are similar in that you take a scoop of bees, dump them in a jar, and shake off the mites. Where they differ is that the alcohol method kills the bees, while the sugar method does not. The alcohol method is probably quicker. Perhaps it more precise as well, I’m not really sure. If I was to do this on my own, I wanted to avoid killing the bees. So I opted for the sugar shake approach. There are a number of videos on this, of course, just search for “sugar shake bees.” I settled on a one by beekeeper Megan Denver. My shopping list then consisted of a plastic tub, a quart mason jar with a ring lid, a half-cup measure, powdered sugar, and some #8 hardware cloth. The #8 wire mesh is perfect for dumping out mites: big enough for the mites to fall through and small enough to keep the bees in. A quick trip to Target found everything but the hardware cloth. I checked Lowe’s, Home Depot, and our local Tractor Supply to no avail. They had the half-inch screen, and the quarter-inch screen, but not the #8 size with a one-eighth inch grid. Perplexed, I called a couple local beekeepers to see if I could borrow a small square from them. Still nothing. So I turned online to see how quickly I might order this, though with warm weather predicted only for a couple days this could be a problem. Fortunately, I stumbled upon a beesource.com thread discussing this very question, and a couple responses indicating that Ace Hardware sometimes carries the #8 cloth. Three stores later, I spoke with Jeff at Twins Ace Hardware in Fairfax, Virginia. Not only did they have #8 cloth in stock, they sold it by the foot. Much cheaper than buying a 10-foot roll online. A short drive later I had what I needed to make a shake jar. My next challenge was finding the wire cutters, which took much longer than I might have thought. 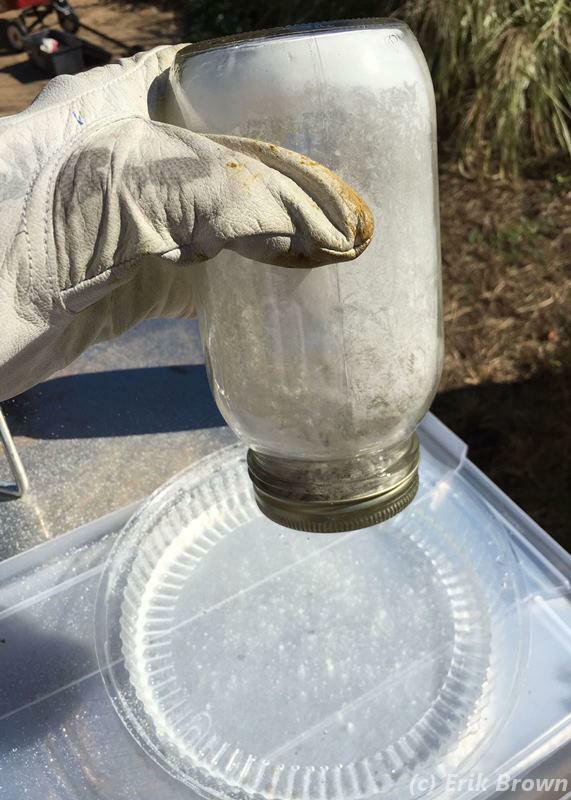 They made short work of the cloth to cut a small circle that fit into the ring lid of the mason jar. I was ready to go. The jar of bees, with the #8 hardware cloth on top, next to the plastic tray. So it was that Monday, October 12 found me in our bee yard looking through our top bar hive on a sunny afternoon . I found a nice brood frame with some open larva, so of course I had to take a picture. This is shown at the top of this post. The frame after this one had open brood as well, so I checked it thrice to make sure the queen was not present and shook it over my plastic tub. The bees where not happy, and many of them tumbled off the frame. A quick tap of the corner made a small pile of bees, from which I scooped a half-cup full and dumped them into the jar. I added a partial scoop to make sure I had a full half-cup, which is supposed to represent 300 bees, and covered the jar. Earlier I added powdered sugar using my hive tool so this was ready to go. This image of a female mite on a bee is part of a University of Florida page on Varroa Destructor. After a brief shake I set the jar in the shade of the hive. The warmth of the bees is supposed to melt the sugar slightly so that the mites can no longer hang on to the bee’s thorax. The mites fall off and are thus available for counting. While this was happening, I finished inspecting the top bar hive. The bees were obviously preparing for winter. The brood nest comb had 3-4 inches of honey above a small brood area, about 10 bars total. Behind these were an additional 4 bars full of capped honey. A little math says this is roughly 40 pounds of total stores, which is probably light for an Italian hive over the winter. The recommendation for our area is to have 60 pounds of honey for the winter months, so I made a mental note to feed this hive as I am able. Our past winter was extremely cold, lasting well into March. It had a been a few minutes, so I shook the bees over a a pie-size tray I had earlier filled with water. 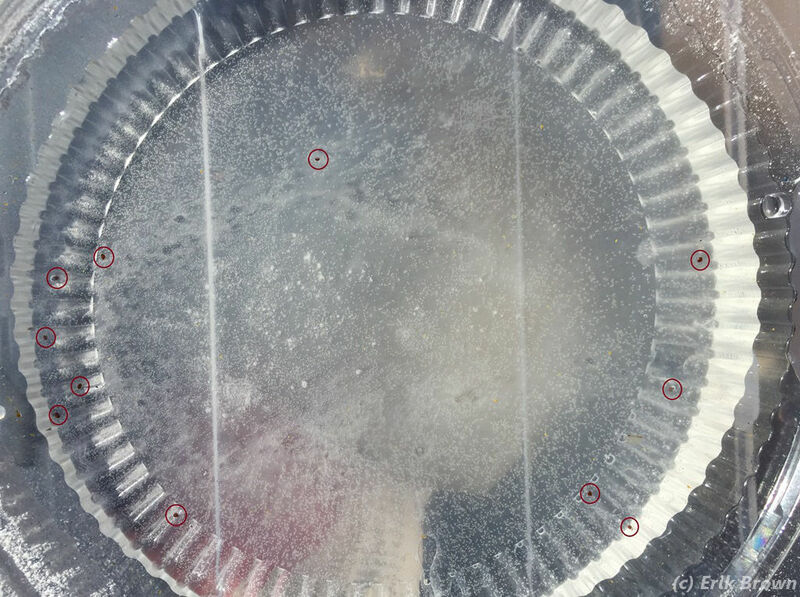 The powdered sugar melts in the water leaving any mites visible. After a few shakes I did indeed see a couple mites – they were thrashing their tiny legs in the water. A bit more shaking until no more mites appeared. I dumped the buzzing sugar-covered bees into the back of the hive, and counted the mites. Later I saw few white bees fanning and otherwise helping with the chores of the hive, so they seemed to be okay. The below picture shows the 11 mites I found floating in the water. After shaking there were 11 mites in the water. The dark dots circled in red are the mites. It was rather disappointing. I set out to show that the hive would be just fine, and instead found a healthy collection of mites. Assuming 300 bees, my 11 mites indicated that roughly 3.7% of the bees were invested with mites. This is rather high as mites grow exponentially throughout the winter as explained in the prior post. The threshold for a “high” measure can vary, as I’ve seen anywhere from 4 to 10 mites recommended. Randy Oliver, author of http://scientificbeekeeping.com, uses a threshold of 6 mites per 300 bees (or 2%) so that was the number I had mind. I should mention here that my Italian bees are standard domestic bee stock from California. 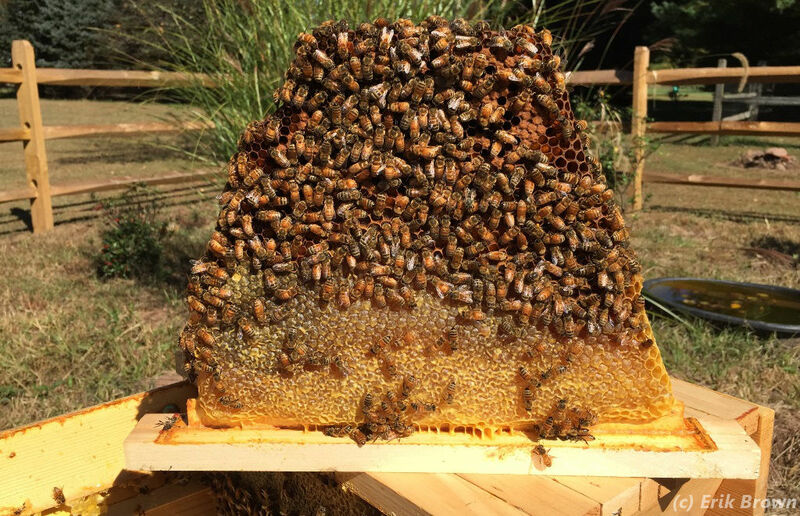 They have no inherent varroa-fighting ability, and the propensity of Italian queens to keep laying throughout the year ensures the mites have a steady source of new brood from which to create more and more mites. 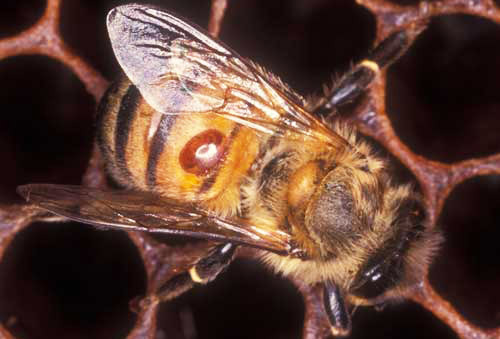 Leaving such bees to fend for themselves against varroa is a losing proposition; like domestic chickens and cattle some care and feeding of these creatures is required. Randy Oliver has a well-written rant on this concept if you care to read it. So, my choice really came down to risking that the hive might die over winter or trying to save it. I opted to save it. Unfortunately the organic treatments rely on warm weather (formic acid and thymol) or a very small brood nest (oxalic acid) to be effective. With cool weather and a healthy brood nest my options are more limited. After some thought, however, I really wanted to avoid the “hard” pesticides that are known to be environmentally unfriendly so I sought the best option available. Another aside: the recommended approach is to treat the bees at the end of summer or early fall. That way you are treating the bees that will raise your winter bees. Summer bees live as little as four weeks, while winter bees live as long as six months. Raising healthy winter bees is critical, so my hive may now suffer by having weaker or damaged winter bees going into cold weather. The organic compounds commonly applied are thymol, using ApiLife Var or Apiguard; formic acid, using Mite Away Quick Strips (MAQS); and oxalic acid, using vaporized crystals or a liquid dribble between the frames. Of these, formic acid seemed like the best bet. Thymol is definitely a warm weather treatment, and oxalic acid is typically used in cold weather when the brood nest is small. Reading the official label, I found that MAQS require daytime temperatures of 50 to 80 degrees Fahrenheit (10 to 30 Celsius) . Lucky for me, the next week of weather was slated to have days of 50+ degrees so this was a viable option. MAQS can be hard on the hive, and in high temperatures the strips will vaporize quickly. The standard full treatment is two strips while a half-treatment uses a single strip. The half treatment is likely easier on the bees, so I choose this approach. In theory, I should apply the second strip a few weeks later, and if we get another warm spell I just might do this. The front of Venus with the boardman feeder cover removed for better ventilation. The MAQS strip is wrapped in plastic and stored in a tub, so you remove the strip from the plastic and set it on top of the brood box in a Langstroth hive. For a top bar hive, I was unable to find a recommended approach for applying mite away strips. The problem is that there is no space between the bars, so laying the strip on top is rather pointless. 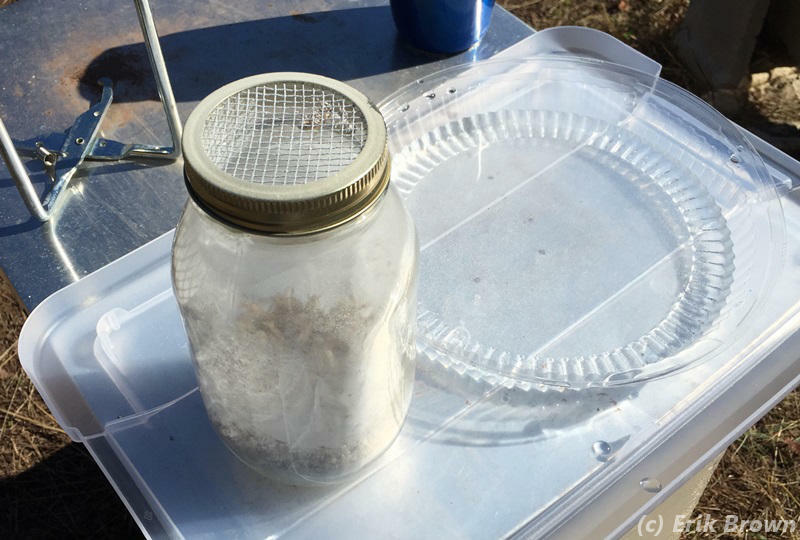 In his book, Wyatt Mangum shows how to insert pesticide strips between the bars of the brood nest, so that’s what I opted to do with the mite away strip. 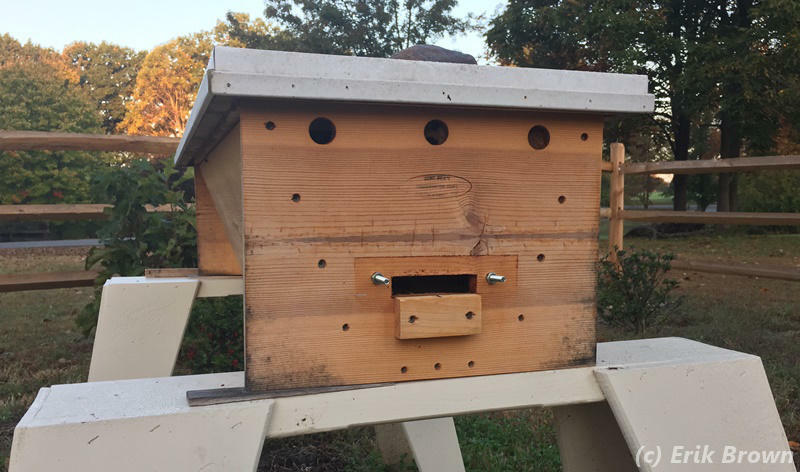 Ventilation is said to be key so I removed the boardman feeder cover from the front of the hive as well as a top bar from the back of the hive. Hopefully that is enough. After four days (yesterday), I replaced the boardman cover as nighttime temperatures were expected to be just a bit above freezing. So that is my journey. If all goes according to plan, the mite levels will be knocked down enough to help the colony survive the winter. If not, well… let’s see what happens. As shared in the first part of this story, our title comes from the Billy Joel song You May be Right, released as part of the 1980 album Glass Houses. For you Dave Barry fans out there, the song was also used as the theme song for the television show Dave’s World. For this post we used the second part of my favorite line: “You may be right, I may be crazy; but it just may be a lunatic you’re looking for.” In the first post I was crazy for not checking my mite levels earlier in the year, in this post I’m a bit crazy for checking for mites so late and still applying the mite away quick strip. Once again, we’ll see how the bees fare over the winter. A special note: it’s been just over a year since I started this blog, with my original alphabet-based post A Bee Sees on October 15, 2014. Go me! Apivar is amitraz. Apilife var is thymol. It is all apiconfusing. And we do not know why #8 screen is so hard to get. We had to travel to the town’s only ‘real’ hardware store with the sages in the back room who will fabricate life-saving wonders and send one home with detailed installation instructions. For the desperate, two layers of #4 carefully aligned might work if they are somehow stitched together so they do not separate or slide out of alignment. Yeah, yeah. Glad I have you here to keep me honest! All these Api’s get confusing, as you say. I updated the post to correct the text. Thank you! On using #4 cloth, that was my backup plan. Within a ring lid, you just might be able to offset the quarter-inch holes enough to create one-eighth inch holds. It has to be hard to get it just right, as I suspect the bees would find any errant holes and then you’d bee in trouble. If you’re looking for a soft treatment, look up the Fat Bee Man on YouTube and check out his mineral oil mixed with EOs vaporizing treatment. I haven’t tried it myself, but I’ve heard others say they’ve done it with good results. The advantage of his method (I think) is that it doesn’t require a 70 degree day (or whatever it is that the commercial treatments need). I certainly was (compelled, that is). I do like the idea of seeing how the count progresses throughout a season. I feel I should try it at least once. As for essential oils, it doesn’t seem like there is a lot of difference between EOs and the soft organic treatments like formic and oxalic acid. Many folks say they are just as hard on the hive, and there are certainly plenty of commercial products incorporating EOs as well as the organic chemicals. The lake of temperature requirements is appealing, though. I’ll have to look up the Fat Bee Man’s videos.